Today is a big day for Overload! We have some good news and some not-so-good news. 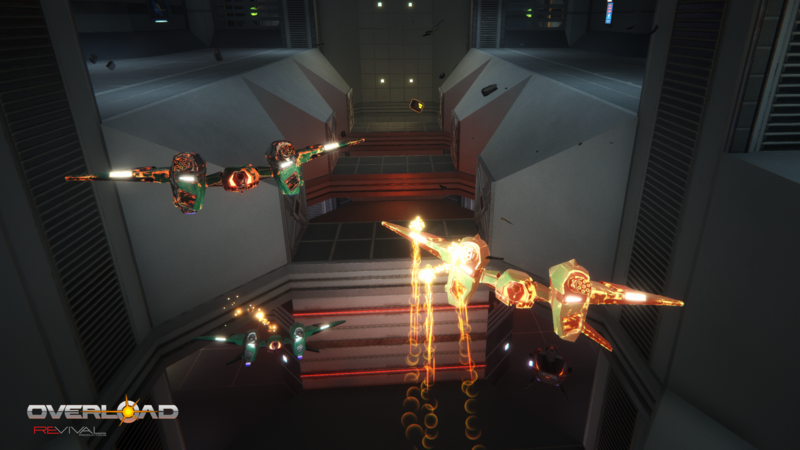 The good news is that Overload will launch on PC (Windows, Mac, Linux) on May 31 on Steam and GOG.com with full multiplayer support. The not-so-good news: We are sorry to say that the Playstation 4 and Xbox One versions are being delayed by a couple more months. We have a small team, and launching on three platforms, particularly with multiplayer, turned out to be more difficult than we expected. The console versions are nearly feature equivalent to the PC version, but there remain some issues for us to address, particularly with multiplayer support. We underestimated the time to integrate and test multiplayer, so we’ve had to delay the console versions to allow us to focus on testing and finalizing it. We realize this delay is disappointing for console backers, but we believe this will result in the best Overload experience, and will ensure that the console versions aren’t rushed through testing. We are sorry about the repeated delays, and really appreciate your patience and support. Our PR push is not limited to the press release and trailer. We have a great group of streamers who will be playing Overload over the next couple weeks. We’ll announce those as the time nears. We’ll also begin streaming from our office each Tuesday and Saturday at 2:00 PM CT, with our first broadcast on April 24th. If you stop by our Twitch channel , you’ll be able to check out us playing Overload, and in future streams you may even catch a glimpse of the first five levels with story elements included. In addition to Twitch, another great way to stay in touch with Revival and find out what’s going on with Overload is to join our Discord channel. You can also catch up on all our videos on our YouTube channel. We even updated the playable teaser. With many people going there to see how Overload looks and plays on their system, we didn’t want something a year old. You can get it off Steam or download from our site. Thanks again for your continued support. We will begin expanding our multiplayer testing over the next few weeks, so beta backers should keep an eye out for an email about that. We hope to have a multiplayer beta test the week of April 30. This is an exciting time for Overload, and we can’t wait for you guys to play the whole game.